Place the 3 different colored chocolate discs into separate glass bowls and melt in the microwave according to package instructions (I did it a minute at a time at 50% power, stirring each time). Drizzle (using a whisk or spoon) a few tablespoons second and third colors onto the base color and do not stir (see photos above). One at a time, fully dip the strawberries into the base color, twisting and turning as you remove them to create marbled patterns. Allow the excess to drip off, then set on the prepared baking sheet. Re-drizzle with the second and third colors over the top again, before you dip another strawberry each time. 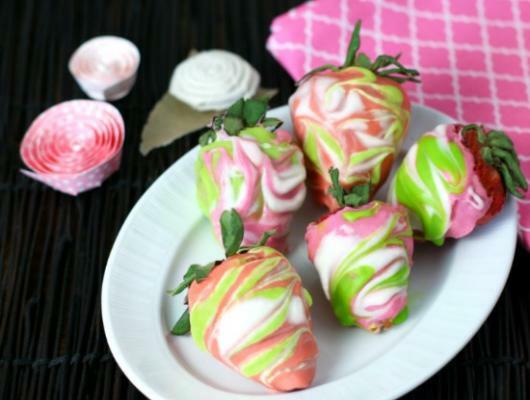 When done, refrigerate the dipped strawberries for at least 15 minutes to harden. 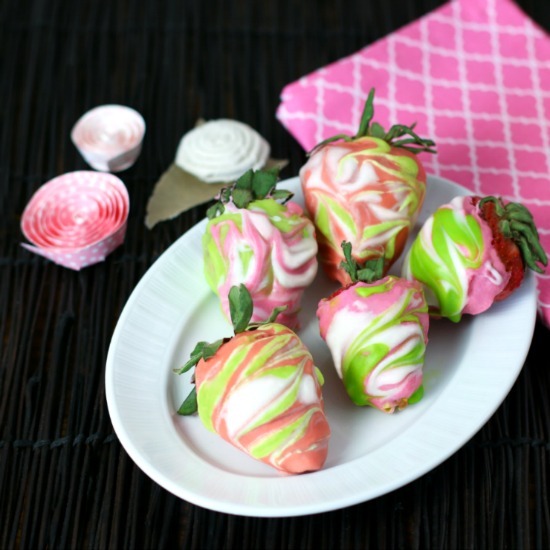 Marbled Chocolate Covered Strawberries are colored candy melts dipped onto luscious, fresh strawberries. Fun, delicious & pretty!